This information on windshield repair is provided as a guide to the novice and professional in Windshield Repairs. 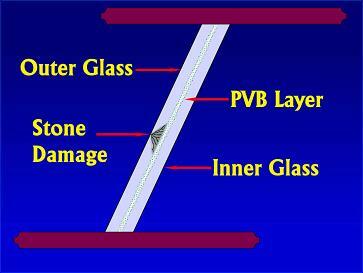 It is intended to allow anyone to learn how to and have confidence in repairing a damaged windshield. With the information provided on this website, you will understand the types of windshield damage that can be repaired and have a guide in choosing a repair kit to fit your needs. Most professional grade windshield repair kits make permanent repairs on most windshield damage such as bullseye cracks, star cracks and windshield chips up to 1 1/4 inches across. There are additional kits and methods that can repair longer chips or cracks up to 12 inches long. Repairs can usually be completed in under an hour with most of the available repair systems. Repairs must always be preformed in shaded areas and on windshields that have been shaded long enough that they are not warm or hot to the touch. Notes: the optimal windshield temperature for most repair resins is between 50 and 90 degrees Fahrenheit, 10°C to 32°C. Temperatures outside this range on the low side will cause the resins to be too thick and cure or flow too slowly where temperatures above this range may cause the resin to cure too quickly. Click here to take a free Windshield Repair 101 course to learn more about how to repair windshield damage and the kits available to perform the repairs.